Are you hungry to make a bigger difference in the world, but your secret 3am fears are getting in your way? 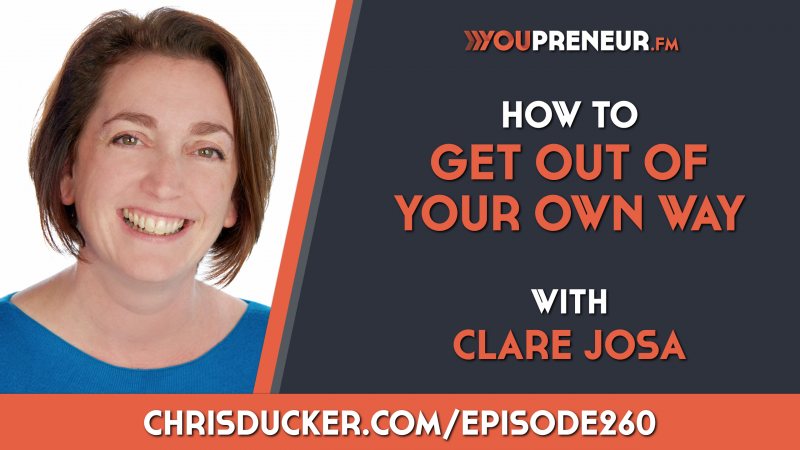 Here's the Youpreneur podcast interview I did for Chris Ducker on this, as well as the resources I promise you, during that session. Here are the bonus resources I mentioned in the Youpreneur podcast interview with Chris Ducker. I hope you find them useful. And if you have questions - or breakthroughs - let me know - here's where we're talking about this podcast episode. For the times when navel gazing isn't an option and you need a quick fix for feeling like a fraud. 60 minutes of practical how-to, to help you spot how you might self-sabotage turn things around. Here are the two books from Clare Josa that Chris talked about during the interview. Chris Ducker is brilliant at teaching people exactly which actions to take to grow their business - he is an expert in business strategy. Clare Josa gets them out of their own way, especially once Imposter Syndrome strikes, so they become fearless action-takers, so that those actions have much more effect, and they can make a bigger difference in the world. After all, there's no point in taking a course on how to use Mailchimp if you are secretly scared that no one will want to hear your message. Whether you're the CEO of an SME or setting up a yoga teaching business, the blocks and challenges that keep us stuck, dreaming big, but playing small, are the same. Clare Josa has been mentoring Passionate World Changers since 2002. 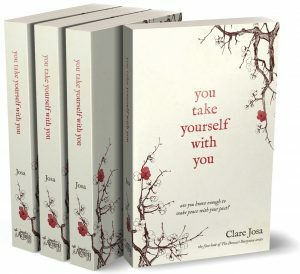 If you've had enough of secretly getting in your own way, Clare Josa can help with her inspired blend of practical business strategy, the essential 'inside work' that most ignore, her inner engineer's common sense, her inner yoga teacher's demystified Ancient Wisdom and a generous dollop of humour. 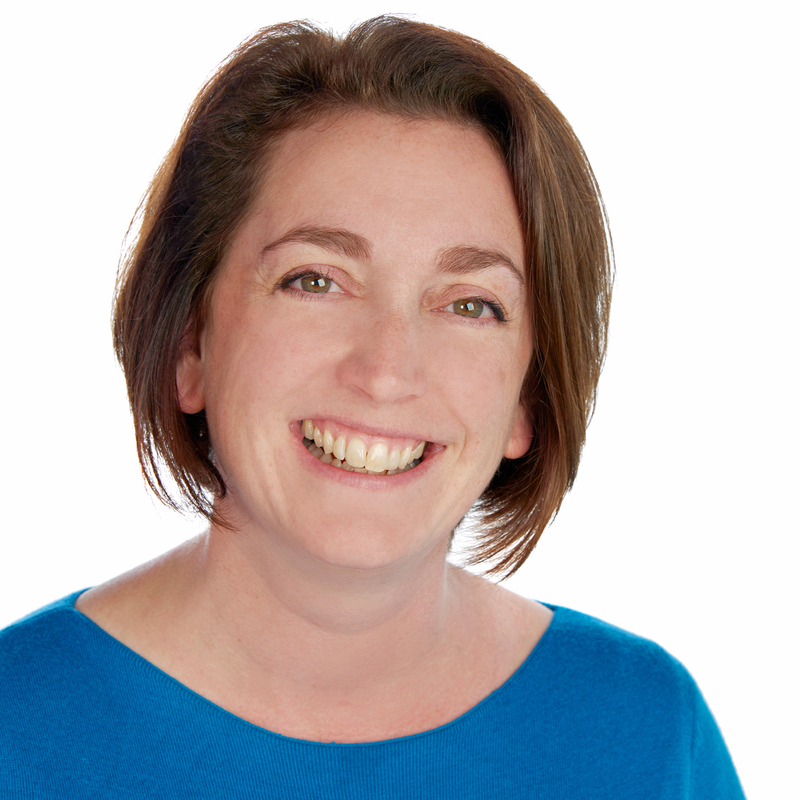 A member of the UK's Institute of Directors, she speaks internationally on how to clear out your secret 3am fears, where nothing else has worked, so you can create the business breakthroughs you have been dreaming of. And that's exactly what she shares with you in Dare To Dream Bigger and her membership community: The Passionate World Changer Club. When not running workshops on how to change the world by changing yourself, her secret addictions are experimenting in her kitchen, hanging out somewhere warm and sunny with her family, and hiding in her hammock under the willow tree, losing herself in a great book. This video is a useful 'quick fix' when you don't have time to analyse and handle the root causes of Imposter Syndrome. Please note: this is normally a paid video, but it is yours, as Clare's gift, to thank you for taking action on your dreams and to thank Chris Ducker for everything he has done to help Clare with hers. This video is from Clare's online course: The Limiting Belief Toolkit. 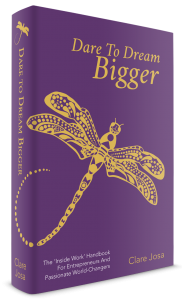 Her business book - Dare To Dream Bigger - also has a large section on how to prevent and handle Imposter Syndrome. Are you hungry to make a bigger difference in the world with your business? You know you have a message to share, but secretly suspect you're getting in your own way? Inspired by over fifteen years of mentoring entrepreneurs and passionate world-changers, as well as running her own business, in Dare To Dream Bigger Clare Josa brings you practical how-to for taking your business to the next level. She seamlessly weaves business strategy together with deep-acting 'inside work' exercises, so that what you're doing will produce breakthrough results. Described as the inside work MBA and one of the most important personal development books of the decade by industry experts, Dare To Dream Bigger guides you step by step through how to clear out your hidden blocks, so you can grow your business, fast and sustainably, making a bigger different in the world - and still having time to spend with your loved-ones. And it's the perfect companion to Chris Ducker's upcoming book Rise Of The Youpreneur. What happens when you get in the way of your happiness? If you enjoy drama, intrigue, exploring human nature and conflict - all delivered with a generous dollop of humour - then you'll love Clare Josa's compelling debut novel about hope against the odds. Sophie is hungry for promotion, but when she rejects her new boss's advances, he sets out to destroy more than her career. As her life falls apart, she tries to escape the black cloud that threatens to overwhelm her - with disastrous results. Will she wake up in time to find the happiness, success and love she secretly craves? When Christof survives a car crash that kills his father, he inherits more than guilt. A mountain of hidden debt risks destroying the cherry farm his family has called home for generations. But Christof's work in Milan wants him to dig up dirt on the Mafia - and distractions could be deadly. Can he save the farm, beat the Mafia and learn one of life's most important lessons, before it's too late? You Take Yourself With You is a journey of courage, hope, humour, love and realising that we're not alone. Readers are describing it as 'unputdownable'.